First of all, I have to admit that frontier-sy stories have always appealed to me. Like many kids, I grew up reading “Little House on the Prairie” books, stories about Daniel Boone, and playing “The Oregon Trail” in school. 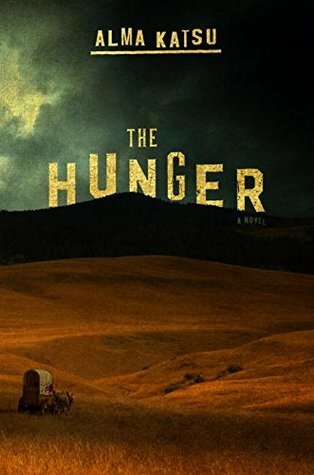 “The Hunger” has got all of that and more in this retelling of the infamous Donner party. In April 1846, a group of settlers left Independence, Missouri headed for a better life in California. The party was led by George Donner and his brother, Jacob. For the first several months, they followed a well established wagon trail, The California Trail, and reached Fort Laramie, Wyoming without incident. There, they took the advice of a trail guide who suggested that he knew of a quicker route. This route proved treacherous and hard to navigate, and the settlers wasted much-needed time chopping their way through dense forests and idling through deserts to get to the other side. They reached the Sierra Nevada mountains late in the year, and became trapped by snow. After killing all of their oxen and horses, they ran out of food. Those who survived the famine ate the bodies of those who died in order to survive. In the end, only half of the original group of settlers arrived in California. Anywho, this is what history tells us what happened to the Donner party. “The Hunger” fictionalizes this account and gives you a much more terrifying version of the journey. In Katsu’s version, the na’it, or the hunger, is a contagion that causes men to become monsters and cannibalize one another. This book is strongly character based. There is no romanticizing of historical figures, they are realistically portrayed as flawed, people with secrets. I wouldn’t call this a ‘scary’ book per se, but the tone is definitely a creepy one. People disappear, animals are attacked, and bodies are discovered, picked clean of flesh. The horror took a while to build as the settlers realize that not only are they running out of supplies and hope, but that they are being hunted by an unseen force. This is an easy 4 stars for me. This book is definitely not one to miss. A blurb on the author’s website reveals that the film rights have been purchased for this book, so I look forward to seeing this on the big screen soon.